4 Levels of Worship : Reform worship. I'm not so sure I'd want to put the burden on the worship pastor to teach all that tho =) I think that the main/senior pastor is the *real* "worship" pastor (by your definition). A sincere and hearty "thank you" for this fantastic post! I think this type of approach could transform church as we know it. I do get a little hung up on what that means for the job description of "worship" leaders/pastors...a question I've been asking for years. As for Church Worship - I loved seeing discipleship listed as a practical embodying of Church Worship. If I could add to that, discipleship helps us better learn and engage in daily sanctification. Sanctification - the act of becoming more like Christ through intimacy, dependence and obedience to Christ within the context of the Church body. So as the Bride embodies Church Worship, I see her passionate cry for unity echoing Jesus' prayer in John 17:21. What a beautiful picture. Anyway, I'm really excited to see the values for true lifestyle worship articulated and prioritized in such a model. Are you aware of any churches that have been following this model? Can you share more about the practical ramifications of implementation? What are loving ways to incorporate such a model into a body of believers unfamiliar with it? Yes, I think everyone in church leadership is a worship pastor, that is, if Life Worship (Living Christ) is the highest level of worship and rules over the other levels. Perhaps we who are by title "worship pastors" but by trade "song leaders" should consider changing our title to avoid confusion and misleading people into believing church music is the primary definition of worship. Also, this brings up the importance for everyone on a local church leadership team to have a similar vision and definition of worship. It may not be the gifting and calling of the song leader to teach people a theology of worship. But the song leader can certainly team up with someone who is gifted to teach (maybe the lead pastor). Then the song leader can choose songs and liturgical elements that support the grand vision. …between you and me, the people who are involved in worship week in & week out, we who represent the church and plan the services? I know who’s fault it is - it’s our fault. It’s our fault because we allow ourselves to be called the 'worship team' when we are really the “music team,' to have 'worship leaders' who are actually 'song leaders,' to have 'worship practices' that are in reality 'band practices.'" It seems we are like-minded. I appreciate the great care with which you use the word "worship." Let me expound upon the model a little more in detail. But first you should know that it is still in formation, as it is only a week or so old. The model isn't something I concocted in the hopes of implementing. Rather it was simply put together based on my observations of what already exists here (more theoretically than actually), and assuredly in other churches. 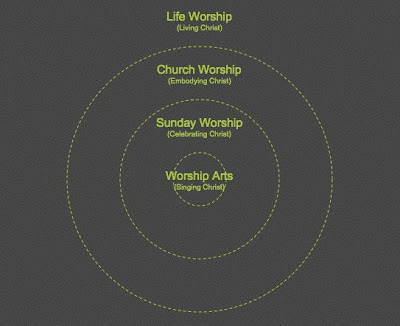 Concerning Church Worship (Embodying Christ), the reason it is contained within a circle below Life Worship is because there is a certain exclusiveness of the Church. And contrary to the social club church mentality, the biblical body of Christ is made up of who God has chosen and redeemed to be a part of His family. As with every healthy organism, growth and flourishment depends on care and nourishment. The stuff that makes up healthy Church Worship is continuing in the doctrine of the apostles and fellowship, the breaking of bread and the prayers. Nicole, I'm not sure this model is something a church can simply choose to follow. It intends to give perspective to church leaders and hopefully make vision casting a bit clearer. If a church were to see this and try to apply it practically, the process would probably have to begin with a whole lot of deconstruction, followed by the adoption of the highest levels of worship (Life Worship and Church Worship) as the overarching definition of worship. Sunday Worship and the Worship Arts trickle down from there. I am confident the ship can be turned around. We must be bold and sensitive. thanks for visiting my blog! feel free to share your thoughts there as well. one of the questions i have to answer now is then: what is considered "acceptable worship" to God? and does the "sunday worship service" have any rules? can we use it purely for teaching or evangelism purposes? or is it a communication tool for the pastor to share his vision of "Life Worship"? i think the plethora of articles and people calling for a proper understanding of "worship" should not go unheeded. God bless you as you strive to do that in your community! Well, this is certainly a lot of food for thought. I appreciate the effort and thoughtfulness you put into this post. I must admit, the diagram scared me a bit until I read some of your thinking behind it. The result seems to be a mixture of how things operate as you view them in your situation and a certain desire to see things be more reflective of holistic life in Christ. 1. Sundays are not the main focus of what we do in our group, so that seems to aleviate a lot of the pressure to provide a good worship experience once a week. It is fun to sing and play together, but the value is placed on the relationships and growth in every day life. To separate worship into these circles seems to be drawing lines where there should be a free exchange and flow. 2. We do not have a strong dividing line between those with formal responsibility and every one else. Some of us take initiative and lead, but we really try to involve others and spur them on to think for themselves and discover what the Spirit is doing and to act on it. It gets a bit messier as meetings are more participatory, but we try to make sure they are safe places to learn and grow and practise. Yes, we carry a certain responsibility as leaders, but one of the primary principles we are trying to impart is that every one is responsible for their own spiritual growth. I once heard someone refer to their church people as "stupid sheep" and it so pained me to hear the insult. We all have things to learn from each other and I believe we have yet to see what a church community fully alive looks like. Anyway, just a few thoughts. All the best to you as you wrestle with good things. Beautiful thoughts for beautiful times, Ryan. Good structure - seems to be a living diagram with great potential.